Holiday lights illuminate City Hall during the Deck the Hall Light Show, presented by Independence Blue Cross, while dozens skate on the Rothman Institute Ice Rink at Dilworth Park, Tuesday, Nov. 21, 2017. 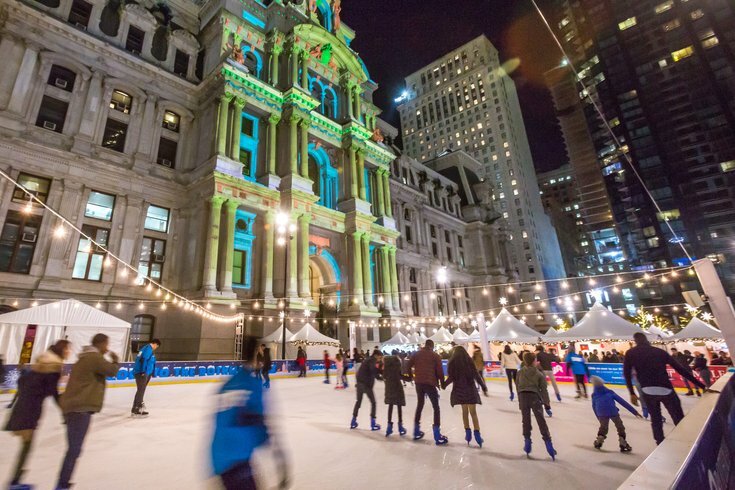 Dilworth Park's Wintergarden opens for the season on Friday, Nov. 10. Included in Wintergarden is the Rothman Institute Ice Rink, the Rothman Institute Cabin and America's Garden Capital Maze. The ice skating rink will be open daily. Admission is $3-$5 and skate rental is $10. On the opening day, those with a military ID can skate for free. The maze, which is free to walk through, will also be open daily. It features twinkling lights, archways made from tree branches, seasonal plants and a decorated gazebo at the center. In conjunction with the maze, there will be free garden workshops. After enjoying the outdoor activities, warm up in the cabin. Adults can enjoy a glass of wine, a specialty cocktail or a selection of beer starting at 5 p.m. on weekdays. On Saturdays and Sundays, the cabin will serve "Brrrrrunch Cocktails," like bloody marys and mimosas, starting at 11 a.m.
Later in November, there will also be a new holiday light show at Dilworth Park's Wintergarden. The Deck the Hall Light Show will begin Monday, Nov. 20. It will run multiple times nightly, through the holiday season. The Made in Philadelphia Market, a holiday favorite, will open Saturday, Nov. 18. The market was designed to complement Christmas Village, which will return to LOVE Park this year.